I love, love, love vegetables! There aren’t too many of them that I don’t like so I have a never ending variety to choose from. Fresh, frozen, steamed, oven roasted or sauteed in a pan – I like them all. Maybe that’s why a plant based diet was so easy to transition to. At first I couldn’t imagine how vegetables could be sauteed with out oil but I quickly discovered that its not necessary at all. In fact the true flavor of the vegetables comes through when it isn’t masked by a layer of liquid fat. Who knew? Just look at how gorgeous these vegetables are! Vegetables are naturally low in calories and fat but high in nutrients. They are comprised mostly of water and fiber so they are filling. If you are trying to lose weight or maintain your weight, get healthy or stay healthy then load your plate full of vegetables. Vegetable combinations like this add visual appeal just look at all that color as well as texture and flavor. It’s a party on your plate! This is how I start my morning vegetable saute. 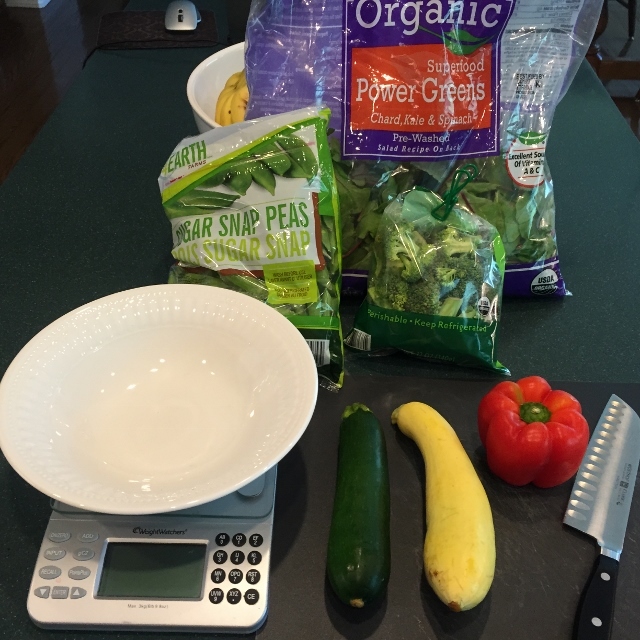 That’s right on Chef AJ’s Ultimate Weight Loss Plan we start our day with a pound of non starchy vegetables. It fills you up for very little calories and no matter what happens later in the day you know you already got in a pound of health promoting food. When you start your day like this it sets you up for a healthy day right out of the gate. If you get hungry after the vegetables you can move on to having some fruit or oats. I am usually quite happy with the vegetables but I don’t eat them until mid morning when I am having true hunger. Get the non stick pan good and hot while chopping the vegetables to go into the saute. I have worked up to about 26 ounces of vegetables in the morning. It keeps me full most days until lunch time. If not then I will have a serving of fruit to get me to lunch. 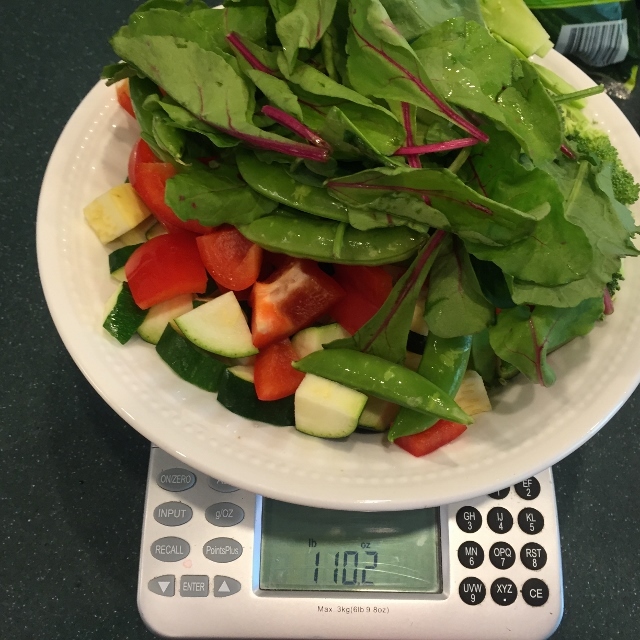 My morning vegetables are the only thing I weigh on this food plan. Everything gets tossed into the hot pan. If the vegetables give off water you won’t need anything in the pan to prevent sticking. The greens in this mixture give off plenty of water once they start cooking, keeping everything from sticking. If you need a little bit of liquid, water or low sodium vegetable broth works well. Just add more as needed. Stir the vegetable frequently until they are tender. There are many no salt seasonings on the market and I have a cupboard full of them. This is one of my favorites from Trader Joe’s. If you don’t have a Trader Joe’s where you live the Mrs. Dash no salt seasoning come in a variety of flavors and are so delicious. Costco also had their Kirkland no salt seasoning that is very tasty. Apply a liberal amount of seasoning once the vegetables are cooked. Good things come from California and this vinegar is one of the good things! 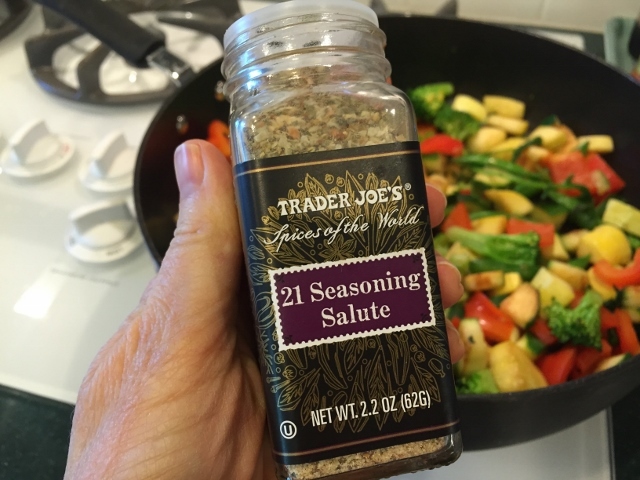 I learned about this product from Chef AJ – it’s one of her favorites. It’s thicker and sweeter than most Balsamic vinegars with a low acidity of 4% which adds to the sweetness. 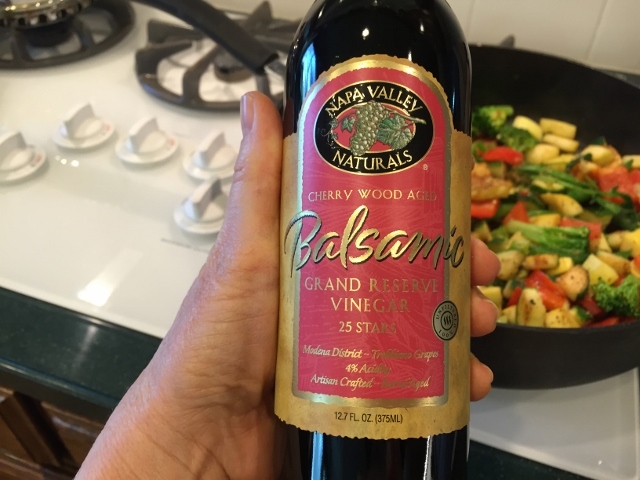 The description on the bottle says “This dark, syrupy, sweet yet lightly acidic vinegar is the culmination of a centuries old Italian aging process.” It’s available at some Whole Foods stores but not all. If you can’t find it locally you can order it directly from the company at Napa Valley Naturals. You save quite a bit if you order a case of it – which is what I did. 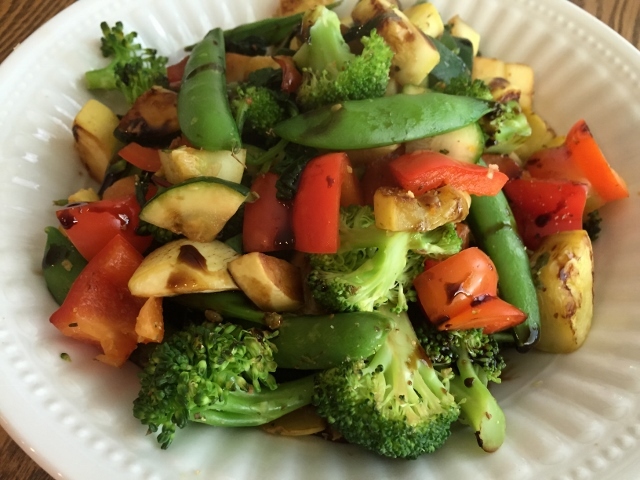 Once the vegetables are cooked just drizzle some Balsamic vinegar over the top for extra deliciousness. 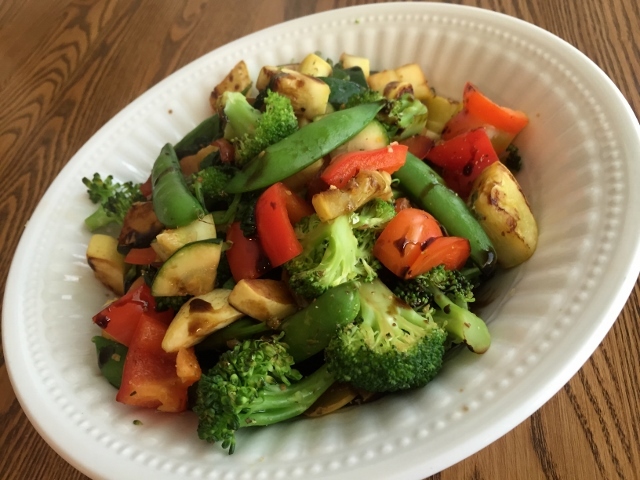 These no oil sauteed vegetables are perfect for breakfast lunch or dinner. With lunch or dinner you can add cooked brown rice, a baked potato – white or sweet – a veggie burger or some cooked beans and you have a low calorie filling feast. The truth is that moderate amounts of natural polyunsaturated fats found in nuts and whole foods do promote a healthy heart however; the highly processed oil that comes from them does not. There is no refined oil found in nature so its not a whole food. When you take a healthy plant food like an olive, avocado or nuts and process the heck out of it and strip all of it’s fiber and nutrients away what you are left with is liquid fat. It’s about 120 calories per tablespoon making it the most calorie dense food on the planet! When you eat oil it coats the endothelium which is the inside lining of the arteries reducing the arteries ability to deliver more blood to tissues. Think about your dishes that have had a fatty food in them. 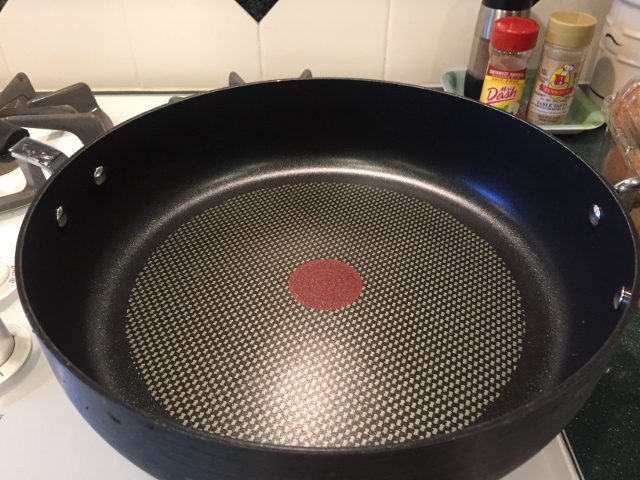 The fat latches onto the pan or serving dish and it takes a good deal of hot water, soap and scrubbing to remove all that fat. Well it sticks just like that to the inside of the arteries. The fat you eat is the fat that you carry with you! No one needs it. There are no healthy oils. 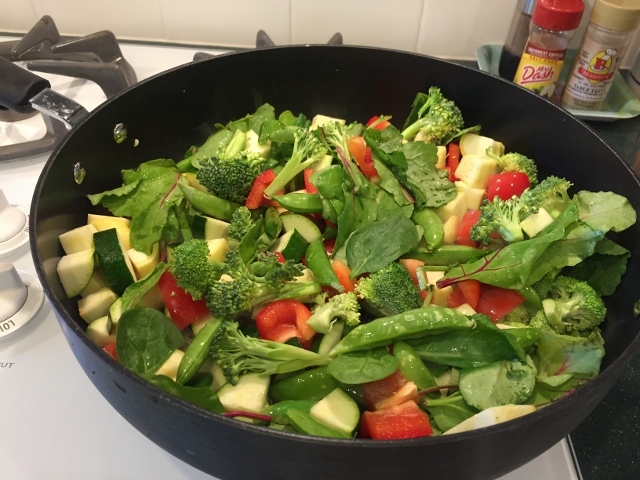 For the same amount of calories as one tablespoon of oil you can have that entire bowl of no oil sauteed vegetables pictured above – which one do you think is going to make you feel full longer, promote good health and help you lose weight? I just wanted to say how much I have missed your blogs and am so glad you are feeling better! I am excited to hear about your new food journey–I need to begin eating healthier and am really looking forward to hearing more from you. Hi Kristi! Thank you so much for your kind words. I too have missed the blog and interacting with readers like you! I am so happy to be back and posting again. It feels so good to feel good! Start eating more vegetables and fruits – they have a healing affect on our body. I am so happy I found your blog! Love the recipes and the ease that I can print things! I am so glad you found my blog! Happy healthy cooking! Thank you Tami for sharing this and the seasoning u use ! May I ask where you get the bag of snap peas ? Such mouthwatering yummy veggies !! I am glad you enjoyed the post! I have been buying snap peas at Costco and Sam’s Club – they have the largest bags and the best price.